In this book, Steele Nowlin examines the process of poetic invention as it is conceptualized and expressed in the poetry of Geoffrey Chaucer (1343–1400) and John Gower (ca. 1330–1408). Specifically, it examines how these two poets present invention as an affective force, a process characterized by emergence and potentiality, and one that has a corollary in affect—that is, a kind of force or sensation distinct from emotion, characterized as an “intensity” that precedes what is only later cognitively understood and expressed as feeling or emotion, and that is typically described in a critical vocabulary of movement, emergence, and becoming. 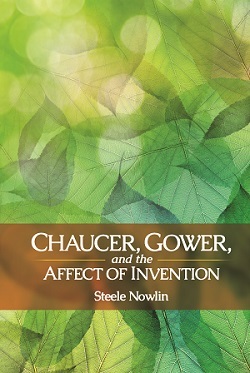 Chaucer, Gower, and the Affect of Invention thus formulates a definition of affect that differs from most work in the recent “turn to affect” in medieval studies, focusing not on the representation of emotion or desire, or efforts to engage medieval alterity, but on the movement and emergence that precede emotional experience. It likewise argues for a broader understanding of invention in late medieval literature beyond analyses of rhetorical poetics and authorial politics by recuperating the dynamism and sense of potential that characterize inventional activity. Finally, its close readings of Chaucer’s and Gower’s poetry provide new insights into how these poets represent invention in order to engage the pervasive social and cultural discourses their poetry addresses. Steele Nowlin is Associate Professor of English at Hampden-Sydney College.